Pure Watercraft has developed an electric motor for boats that’s designed to help the environment, reduce noise and save on maintenance costs. A quiet morning on Lake Union, the peaceful twitter of birds, a light breeze and — the sputtering of a boat motor. 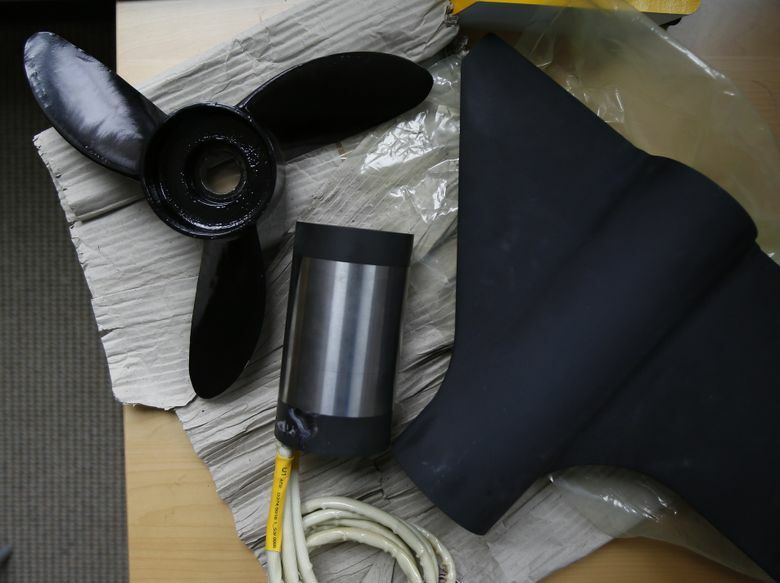 The motor, called the Pure Outboard, is taking pre-orders Wednesday and plans to deliver motors to a pilot group of customers by the end of the year. The Pure Outboard is meant to replace gas motors that run between 9.9 and 40 horsepower. The Pure Watercraft models range from 9.9 to 25 horsepower. The idea is to help the environment, cut down on noise and save heaps of money in maintenance, the company said. The motor is designed to last nearly maintenance-free for more than 10 years, even for frequent boaters. CEO and founder Andy Rebele has been developing the motor with his nine-person team for more than four years. Rebele lives on Lake Washington in Seattle and relies on his two Teslas to get around. He likes the cars for their silent motors and low environmental impact, and he wanted his boat to match. Pure Outboard weighs about 80 pounds and is purchased with at least one battery pack, which weighs about 90 pounds. On Rebele’s rowing launch, he uses two battery packs to get a longer range. The motor connects to the packs with cables, and the batteries can be charged at standard outlets found on nearly every dock. With a 120-volt charger, a battery pack can reach a 50 percent charge in two hours and 50 minutes. Using a 240-volt charger, a pack will be half-charged in an hour. The motor’s range varies with speed. 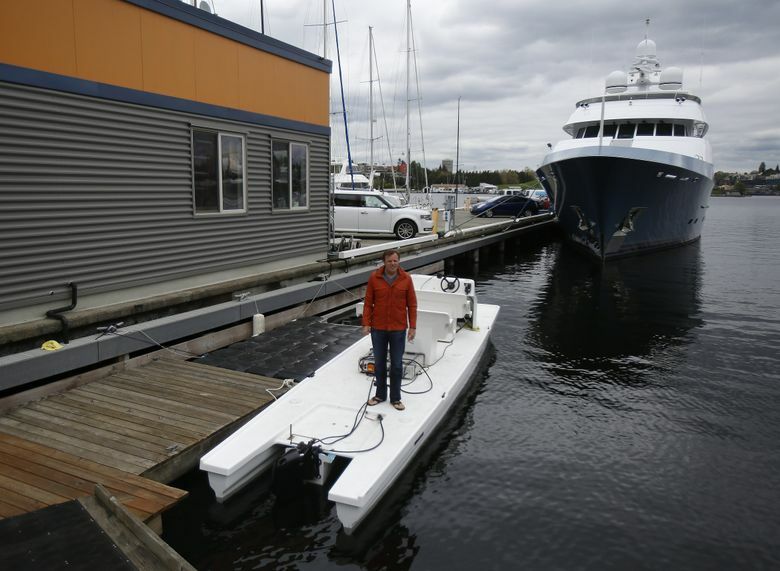 Using two battery packs, the boat can travel 20 miles going 12 mph or 11 miles going 20 mph before needing a charge. On a recent spin around Lake Union, Rebele showed off the motor’s quiet hum and small wake. Pure Outboards, which start at $12,000 for a motor and one battery pack, are not cheap, and Rebele doesn’t think early buyers will care. Pure Watercraft estimates that 2 million people in the U.S. own boats with comparable gas motors. It’s reasonable to think that a least one-third of those people will switch to electric in the long run, Rebele said. “The motor gets cheaper and cheaper over time as oil becomes less and less available,” he said. Pure Watercraft is not the only fish in the sea of electric motors. German company Torqeedo is the leader, with several motors available. 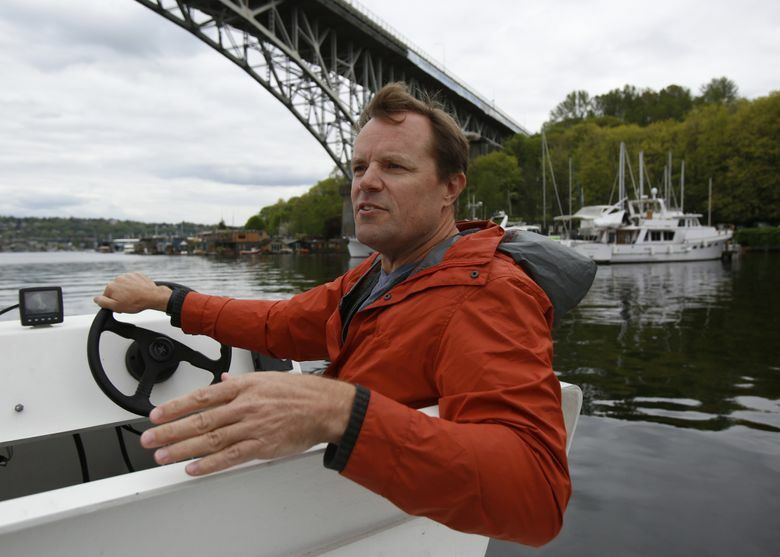 Other startups have been popping up recently around the U.S., driven partly by Tesla’s success, said Michael Beemer, chairman of the Marine Maintenance Technology Department at Skagit Valley College. Range and expense are the big factors holding back a boom of electric boat motors, he said, though in the long-term cost is generally lower with electric motors, Beemer said, because they last longer and cost much less to maintain. Pure Watercraft has been testing the motor with rowing teams at universities across the U.S., including the University of Washington. Rebele expects rowing coaches to be a main customer, at least initially, because having the motors on the rowing launches will reduce noise and maintenance fees. Bob Ernst, who coached rowing at UW for nearly 42 seasons, said the motor is the answer he had wanted for years. Ernst went through gallons upon gallons of gas while coaching, and was just waiting for someone to make an electrical motor that would have enough power to be useful. UW plans to pre-order two motors, Rebele said. A few dozen university rowing teams have told Rebele they plan to pre-order the motors, he said. Pre-orders not chosen to be part of the pilot group will get motors at the end of 2017.